For more than a century, AAA has been a trusted provider of roadside assistance, insurance, auto repair, maps and directions, travel booking, driver training, and member discounts. Today, AAA is North America’s largest motoring and leisure travel organization, with 40-plus member clubs in the United States and Canada serving some 53 million members. Recently, one of those clubs, Ohio Automobile Club (OAC), significantly upgraded its Web-based travel system to give travel agents and members access to the same information and services. The result is the Travel Syndication Technology (TST) system, which provides a Web portal for members to research and book travel online. Within the first year of putting TST into production, car and hotel travel sales increased by 53% as more OAC members made Ohio. AAA.com their preferred travel site. Central to the success of TST was the integration of the new Web-based travel portal with OAC’s back-office systems, including the AXIS membership system from Campana, which is used to confirm users’ membership status. Providing this integration is the award-winning, 100% open source WSO2 enterprise middleware platform. The vision for TST began in 2007 when OAC sought to expand its current offerings and become a primary source for members to book all their travel needs. The club also wanted to increase engagement and foster loyalty among members by providing them with a consistent experience whether they used the website or worked with one of OAC’s travel agents. This meant the new travel portal would need to integrate with other backend systems, ensuring that travel agents and members had access to the same information at nearly the same time. By 2011, OAC had begun developing TST and needed to determine the middleware that would best support a service-oriented architecture (SOA) to facilitate the integration of TST with other back-office systems. The club evaluated both proprietary and open source middleware platforms from leading vendors. Soon three key factors led OAC to select WSO2 Carbon. First, OAC’s evaluation determined that the fully componentized architecture of the WSO2 Carbon platform would provide the flexibility to support the IT organization’s project requirements and deadlines. Additionally, the open source model provided a cost-effective approach for delivering the solution. Finally, and perhaps the most important though, was the proven performance of WSO2’s software within other organizations. WSO2 had demonstrated the ability to handle a high volume of booking transactions with eBay, which by 2011 was handling 1 billion transactions per day with the WSO2 Enterprise Service Bus (now repackaged as WSO2 Enterprise Integrator). At the same time, the National AAA organization and other clubs in the federation had completed successful IT projects using WSO2’s software and services. Today, OAC members can visit ohio.aaa.com to access the TST portal and shop for air travel, car rentals, and hotel reservations. Behind the scenes TST integrates with travel vendors in order to complete the transactions. Once the booking is completed, information is then provided back to OAC via HTTP Web services. Two products within the WSO2 platform facilitate the backend processes: WSO2 ESB and WSO2 Governance Registry. 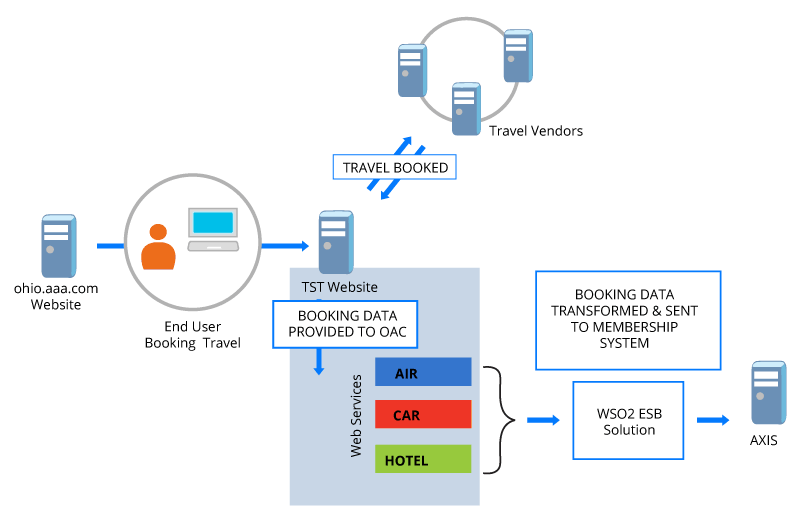 One WSO2 ESB, which also acts as the load balancer, connects to TST and retrieves booking information from HTTP Web services for air, car and hotel on a configurable schedule. This load balancer then sends the messages to a two-node ESB cluster for further processing. The clustered ESBs transform the XML messages received from TST into Campana’s version of the Open Travel Alliance (OTA) XML format, which is a standard in the travel industry. These transformed messages are then sent onto the AXIS back office membership system used by OAC. Meanwhile, WSO2 Governance Registry resides on the backend with the two WSO2 ESB servers to provide runtime governance. The Ohio Automobile Club was able to address four main project challenges by taking advantage of the highly configurable WSO2 ESB architecture for the TST integration. Because ESB mediators can be configured to adapt to nearly all enterprise integration requirements, the need to write custom Java code is virtually eliminated, significantly speeding project delivery. Flexibility. OAC required a flexible architecture to handle the potentially high volume of small-to-large messages. By deploying a two-node cluster and using WSO2 ESB as a load balancer, the organization is able to ensure high availability without any errors or hangup—even during peak periods. Additionally, this offers OAC the flexibility to manually pull bookings when necessary. “Delivering a consistent experience is critical to the adoption of our travel portal, and WSO2 ESB gives us the confidence that our system will remain highly available even during peak periods,” Robert said. Data Mapping. The OTA format has been widely adopted by the travel industry, so OAC needed to convert TST messages, which have a different XML schema, to the OTA format before sending it across to the AXIS system. Ongoing Development. OAC is continually enhancing the functionality of TST to improve efficiency, accuracy or the customer experience. For this reason, the club was looking for both flexible software and a solution partner in WSO2. For example, OAC later needed to convert data time zones from Coordinated Universal Time (UTC) to Eastern Standard Time (EST) and Eastern Daylight Time (EDT). To support this development, the WSO2 team built new functionality to pull bookings recorded in UTC and convert them to the local time zone. Auditing. OAC requires a means of auditing and monitoring all bookings completed through TST. To address this need, the organization uses WSO2 ESB to write all of the bookings to a MySQL database using the DBReport mediator while the ESB also is sending the booking to AXIS. The organization then monitors the content using a .NET Web frontend to view individual bookings as they are sent to AXIS, providing an on-demand view of the booking data. The Ohio Automobile Club has realized success with TST on several levels. In TST’s first month of operation alone, travel sales increased by the following: car 96%, hotel 42%, and air 13% over the previous year (2011). In 2013, hotel and car sales again increased an additional 45% And 16% respectively over 2012. In addition, a new “Activities” product was launched in 2013 and has resulted in 23 bookings that was not possible via the web site before. Internally, OAC was able to significantly streamline the implementation process. In fact, most of the back-office integration was completed in less than a month using WSO2’s middleware. Additionally, by automating many processes, OAC now saves the hours of hand-processing each trip manually into the Axis system that used to occur each day before the WSO2 solution was deployed. Already OAC has begun extending TST to other organizations, as well as developing a roadmap for expanding TST. In addition to helping extend TST to other AAA clubs, OAC also is planning to add more travel products, such as cruises, and enhance functionality for travel agents. “TST has been a major project, and with WSO2, we’ve succeeded better than we ever could have expected,” Robert said. “We now have a tremendous opportunity to build on that success, and WSO2 will be a strategic partner as we move forward.